One of my favourite things to do is drive the car with the music playing and sing at the very top of my voice. I’m not a great singer but I do enjoy it! Like all mothers – I fear that something terrible will happen to one of my children. Joyful. Warm. Fun. Vivid. Enticing. Entertaining. Enthralling. Empathetic. Imaginative. Colourful. Passionate. Joyful. Adventurous. Obsessed. Connected. Definitely Lucy Pevensie from the Narnia series. I have always dreamed of finding a door in the back of a wardrobe door which leads into another magical world. The closest I have ever found to it though is opening a good book and slipping into a different and entrancing world. I have spent the last year researching circuses in the 1930s, for my new timeslip book The Sequin Star, which has been so much fun. So I would have to head back to 1932, the middle of the Great Depression, which was a fairly bleak time, but life in a travelling circus would be absolutely fascinating. My three children. It was my kids who helped me to rediscover the power of the imagination. I have written all of my books for them. They give me ideas and feedback, tell me what they love about my books, and encourage me to keep going. My mother always encouraged me to write from a young age. We had a house filled with books and I read as much as I could. I have been writing more or less non-stop since I was about eight years old. 11. What is your favourite picture book and why? Are we There Yet? by Alison Lester. I love all of Alison Lester’s books, but this one is very special to me because we took this book with us when my family travelled around Australia for 18 months, and it inspired many of our adventures together. I also adore her Magic Beach. Now that is a hard one! Perhaps We’re Going on a Bear Hunt by Michael Rosen and Helen Oxenbury. When my kids were young, this was definitely a favourite, and we still recite from it often. 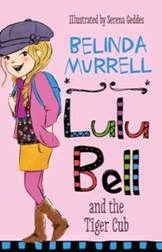 The two latest books in Belinda's wonderful Lulu Bell series are out now! 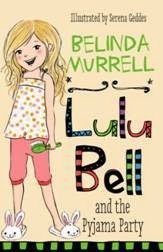 Learn more about Binny at belindamurrell.com.au.